This week we reached the end of June, which was friendly for financial markets. 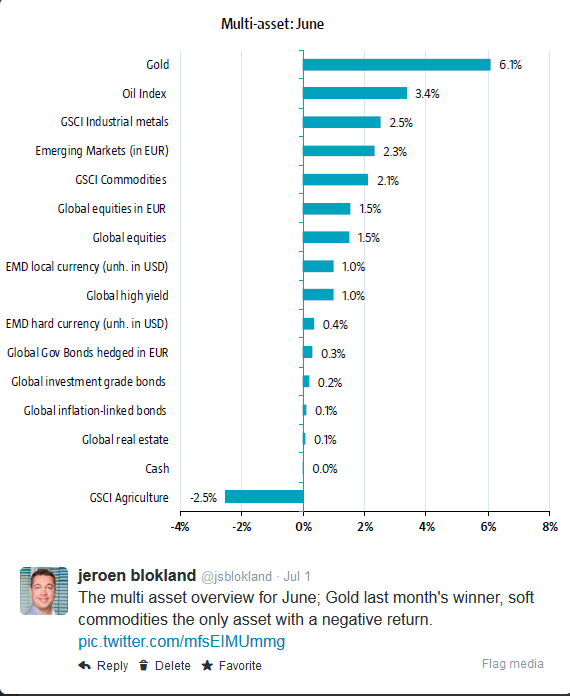 All asset classes yielded positive returns, except one. Agricultural commodities prices went down by 2.5%. Gold experienced a strong month, gaining more than 6%. For other asset classes, check out the graph below. Equities also yielded a decent return. 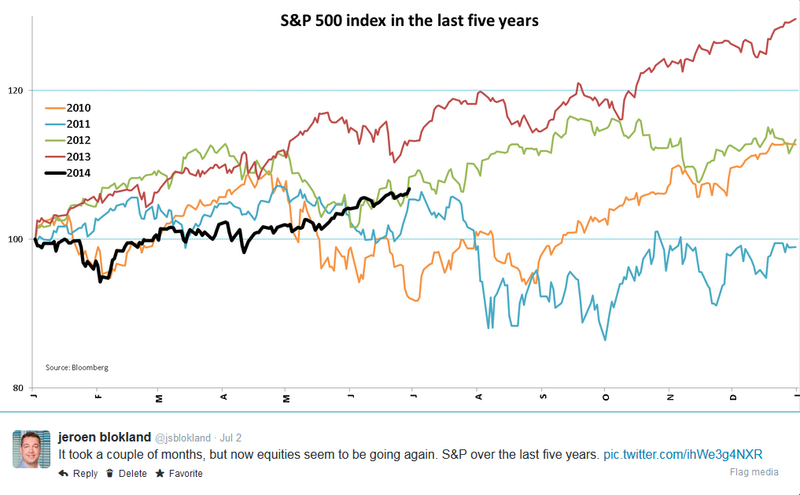 It took a couple of months to get things going, but, recently, equities have resumed their steady increase. Volatility remains extremely low. But as mentioned before this ‘low vol’ environment could stay with us longer than we might expect. This week, the following table appeared numerous times on my Twitter timeline, showing that we are ‘now’ 51 (today would actually be 53) days without the S&P moving more than 1% on a day. History shows that this period can be prolonged for quite a bit. 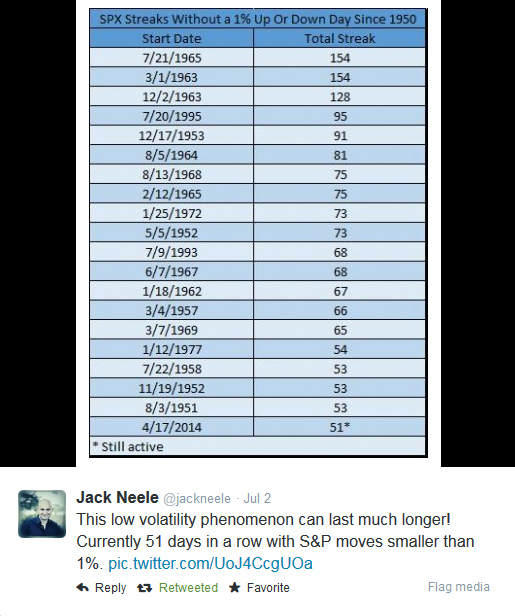 Interestingly, however, long streaks without daily moves of over 1% have been strikingly scarce in recent decades. Low volatility is of no ‘concern’ to Dubai. 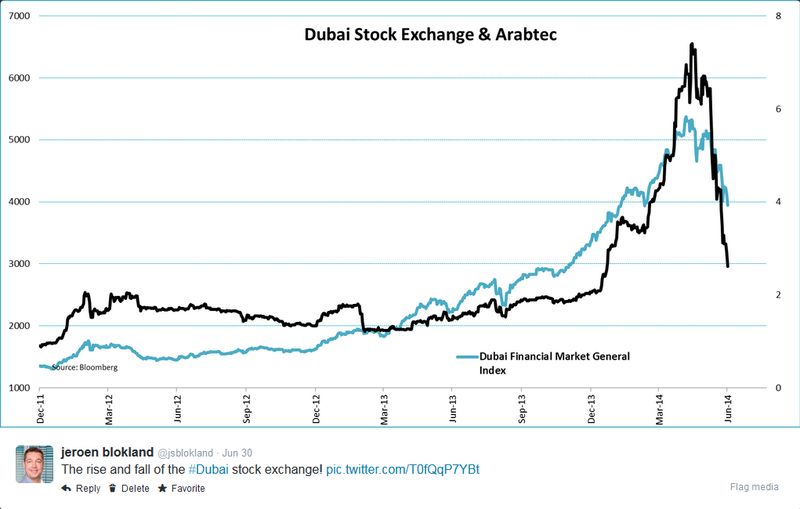 Construction company Arabtec has run into trouble, losing about 60% of its value along the way, and dragging the overall Dubai stock index with it. Data from the US was very impressive this week. 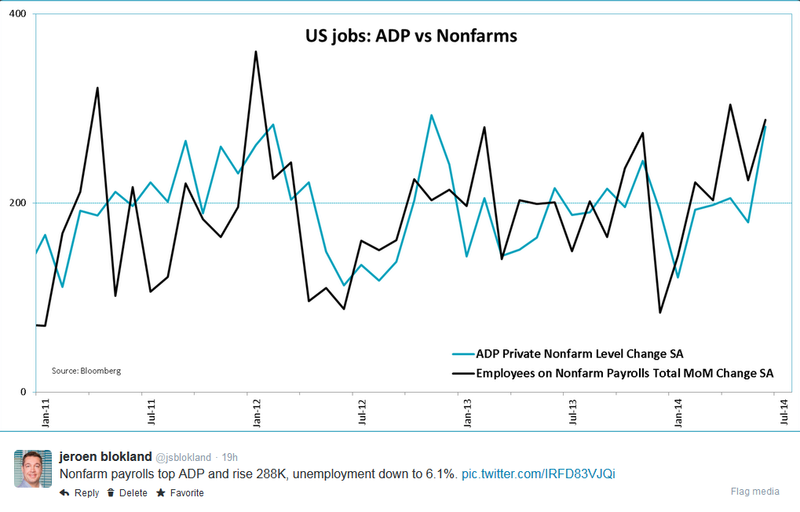 First, the ADP employment data beat expectations. On Thursday the nonfarm payrolls caught even more attention, rising with 288K. I guess we have finally left winter behind us. Unemployment also came in better than expected, moving very close to the 6%-threshold. 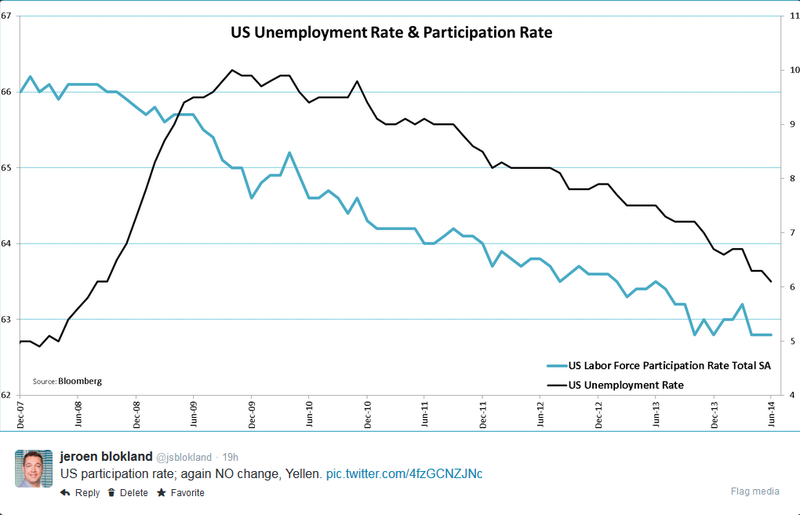 The participation rate is showing no signs of life, and that should make Yellen feel a little bit awkward. She confirmed that a bubble or two does not alter the path for monetary policy, but further strengthening of the job market could make people a little wary. This week was also ‘Markit PMI’-week. 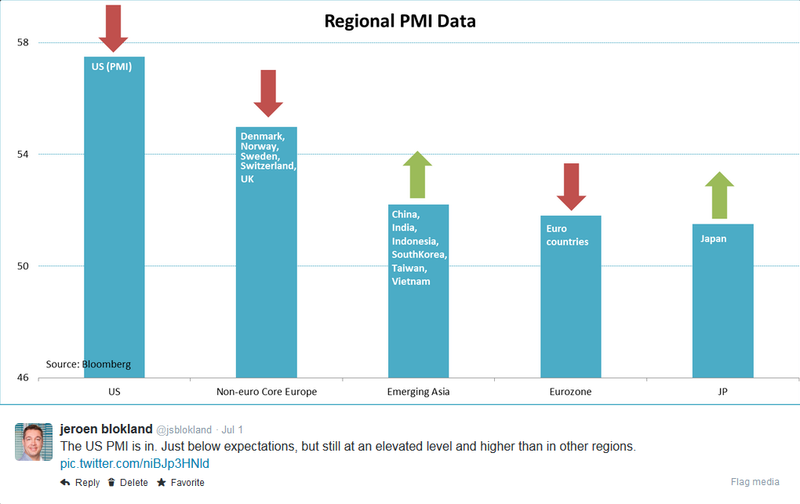 The published PMI data revealed some interesting developments. First, emerging Asia, which has long been the laggard in the chart below, is on a rebound. Second, Emerging Asia has surpassed the Eurozone, which is fallen back a little. Especially, macro data for France, the new sick man of Europe, was yet again very disappointing. 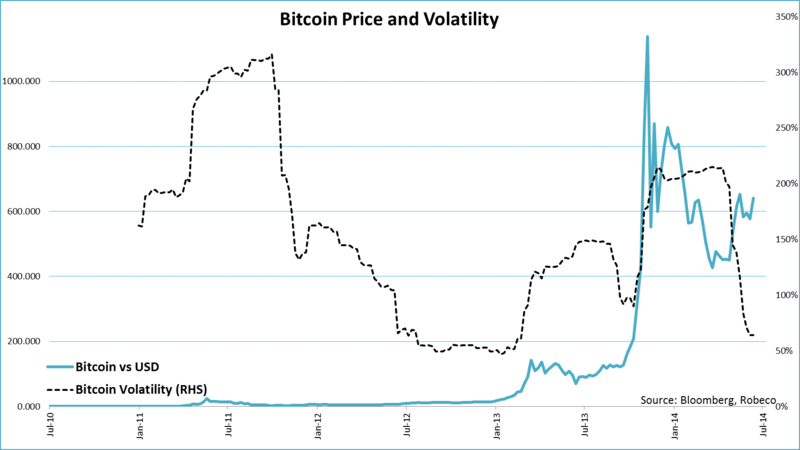 One final word on volatility; it even declined for the most volatile ‘thing’ out there, Bitcoin. In recent months Bitcoin’s realized volatility has come down sharply, following a bunch of good news. California legalized alternative currencies, online electronics company, Newegg, is the latest big company to accept Bitcoins, Expedia sold more Bitcoin-paid hotel rooms than expected and last but not least Russia might consider legalizing the crypto curreny. Yes, that is Russia. The party was crushed, however, by the European Banking Authority, which ‘advised’ banks not to engage in virtual currencies, citing that the risks outweigh the benefits. So volatility is probably guaranteed here.